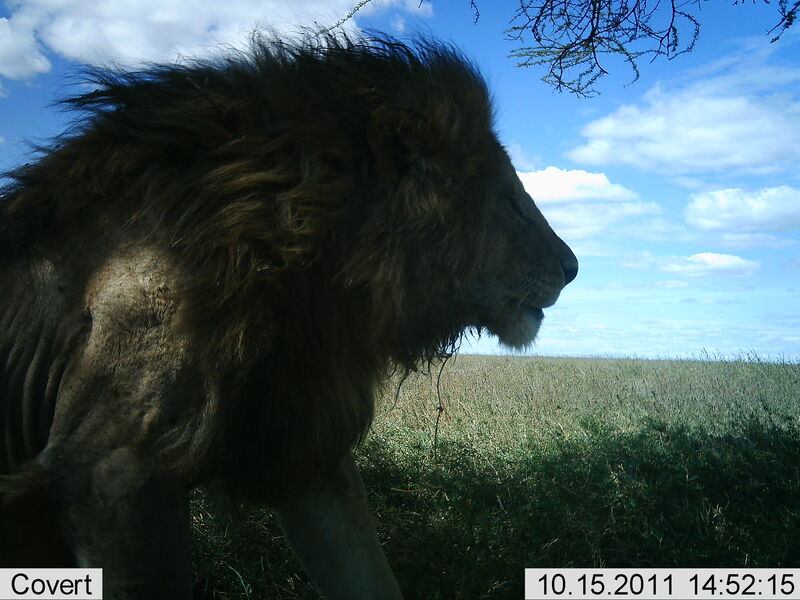 Seven years ago, the University of Minnesota Lion Center set out 225 cameras in Tanzania’s Serengeti National Park. These cameras have recorded over 50 species including some of the most threatened species on Earth. With help from over 140,000 citizen scientists from around the world, millions of photographs were reviewed and classified over the past seven years, which provided park managers, conservationists, and researchers with the necessary information to analyze African wildlife population dynamics. This collective effort is a major contribution to ecological research, allowing for the evaluation of long term trends in wildlife populations as well as best practices in conservation management of charismatic african mammals. Snapshot Serengeti was one of the first camera trap surveys to document wildlife populations in a national park and is now one of the longest running camera trap surveys in the world. We have learned a lot over the years, from how to keep our cameras safe from hyena jowls to retrieving data from memory cards that have gone through a wildfire. We are continuously looking for ways to improve this project. Don’t worry! Snapshot Serengeti isn’t going anywhere. In fact, it will remain essentially the same as we transition into our new platform. The discussion forums and personal image collections will still be available to current and future users. Now, participants will be able to see numerous other parks in addition to the Serengeti. SnapshotSafari will showcase camera trap images from multiple camera trap grids inside dozens of parks and reserves located in six African countries. Intrepid citizen scientists will be able to choose from various exotic habitats, including but not limited to: the Sand Forests of KwaZulu-Natal, the Lowveld of Limpopo, the Fynbos of South Africa’s Cape, and the Karoo desert, in addition to such remarkable ecosystems as Mozambique’s Niassa Reserve, Tanzania’s Ruaha National Park, Swaziland’s Mbuluzi Game Reserve, and Botswana’s Makgadikgadi Pans National Park. By incorporating multiple sites, we can ask more complex questions regarding African wildlife populations and the factors that contribute to ecosystem stability. For example, researchers can compare population dynamics of reserves that are fenced versus those that are unfenced, or theycan evaluate the environments that successfully host multiple predator species without depleting prey populations. Researchers at the Lion Center will use this dynamic platform to investigate the cascading effects of large mammal reintroductions and ways to limit direct human interventions while still maintaining stable ecosystems within fenced reserves. SnapshotSafari provides an opportunity for participating reserves to collaborate and subsequently develop the most effective conservation strategies for protecting biodiversity. We are working hard to get SnapshotSafari ready to launch in January. We just completed beta-testing, and the feedback has been very positive. To all of the citizen scientists who participated and to those who continue to be involved with Snapshot Serengeti, we are extremely grateful! Now, we need your help to finish classifying the final series of images on our original platform, Season 10, at http://www.snapshotserengeti.org before we initiate SnapshotSafari, which will host Season 11. We are very close to finishing classification of these images, so don’t hesitate to invite your friends and family to take a trip to the Serengeti through the lens of one of our camera traps and classify wildlife. Let’s push this meter to the end! Stay tuned for an official count down, so you can be one of the first to participate in SnapshotSafari and contribute to our collective knowledge and ability to successfully conserve African wildlife. This weeks guest blog is from our moderator David Bygott who has been guiding us through Snapshot Serengeti images since the beginning. I’ve been lurking here for years as a moderator, but Lucy Hughes invited me to come out of the shadows and tell you how I got my Serengeti creds. As a country boy in England I was obsessed with nature and yearned to see more of the world’s wildlife. Reading “Serengeti Shall Not Die” by Bernard Grzimek, inspired me to go there. The dream took some years to achieve. First, I worked hard to get a zoology degree. Then, I wrote to anybody doing field research in Africa who might need a research student, assistant, or slave. I got lucky. A scientist, studying hyenas and wild dogs in Ngorongoro Conservation area, wanted me to work on her better-known chimpanzee project, which I had been following in the pages of ‘National Geographic’. Sounded good. Thus in 1969 I pitched up at the camp of my new bosses, on the floor of Ngorongoro Crater. Ten days of getting to know Jane Goodall and her photographer husband Hugo van Lawick, and total immersion in African wildlife. Incredible nights of watching hyena packs run down wildebeest and tear them apart. Even a road trip into the heart of Serengeti. A seed sown, my mind blown, I continued across Tanzania to the remote chimp camp at Gombe National Park on the beautiful forested shore of Lake Tanganyika. Here I spent 2 amazing years with a small team of young people, following the famous chimps through the forest and recording their behavior. Experiencing at first hand our closest kin was a life-changing experience for me. While at Gombe, I met more of my scientific heroes. Bernard Grzimek visited, so did Dian Fossey, and I travelled to Rwanda to see her gorillas. Jane’s doctoral advisor Robert Hinde came, and encouraged me to write up my fieldwork for a Cambridge PhD. Two unexpected things happened at Cambridge. I met my wife, primatologist Jeannette Hanby. And we got to know Brian Bertram who had studied Serengeti lions for 4 years, following George Schaller’s pioneering work. Brian persuaded us that social carnivores were just as interesting as primates, and that there was still more to learn about lions. It was a change of direction, but we were tempted! So in 1974 we joined the Serengeti Research Institute as lion biologists, thanks to support from the U of Cambridge. Our main mission was to census the lion population, as National Parks feared that lions were decreasing (they weren’t!). We also compared the lives of lions in different habitats (Serengeti Plains where prey abundance is seasonal, and Ngorongoro Crater where prey is always abundant). And we investigated lion pride dynamics – why do some individuals leave, and others stay? Imagine being part of a community of scientists studying every aspect of the ecosystem. We had a house in the centre of Serengeti and a Land-rover to go wherever we wanted, and we spent our days and nights with the great tawny cats. It was remote, but fortunately we were both used to that. Every month we made a supply run – either to Arusha or Nairobi, each at least 200 miles away, mostly on dirt roads. This took 2 days each way, plus several days of shopping and socializing. We learnt a lot about fixing cars, often in beautiful remote settings with primitive tools. There was much less technology then. We had basic maps but no GPS, radio or mobile phones or internet. There were no computers, though we had cutting-edge hand-calculators. Radio-telemetry was in its infancy; we built our own radio-collars and darted and collared a few lions, but for most of our study we had no air support and ground-to-ground range was poor, so we had to rely on careful searching to find the lions – scanning with binoculars, driving, staying out at night to listen for roars. We identified the lions from natural markings and close-up photographs, on film of course. We developed a symbiosis with cheetah biologists, George and Lory Frame, photographing each others’ study animals whenever we saw them and trading ID photos to increase our sightings. We learnt as much as we could about what all our colleagues were doing, and often participated in ecosystem-wide aerial animal censuses. We tried various methods of counting lions, including aerial and ground transects and individual recognition. The latter proved the most successful, but it was hard work to identify all the lions in our 1000 square study area. In addition, every second month we’d spend a week in Ngorongoro Crater. After finding as many lions as we could there, we would follow one pride for 4 days and nights, to observe their activity, range and hunting success. We did the same with a comparable pride living at Sametu on the Serengeti Plain. The story of the Sametu pride unrolled like a soap opera, and we couldn’t resist writing a book about them. “Lions Share” tells their story, but also incorporates much of what we knew about lion behavior and about the ecology of Serengeti. (Out of print, but look on Amazon). 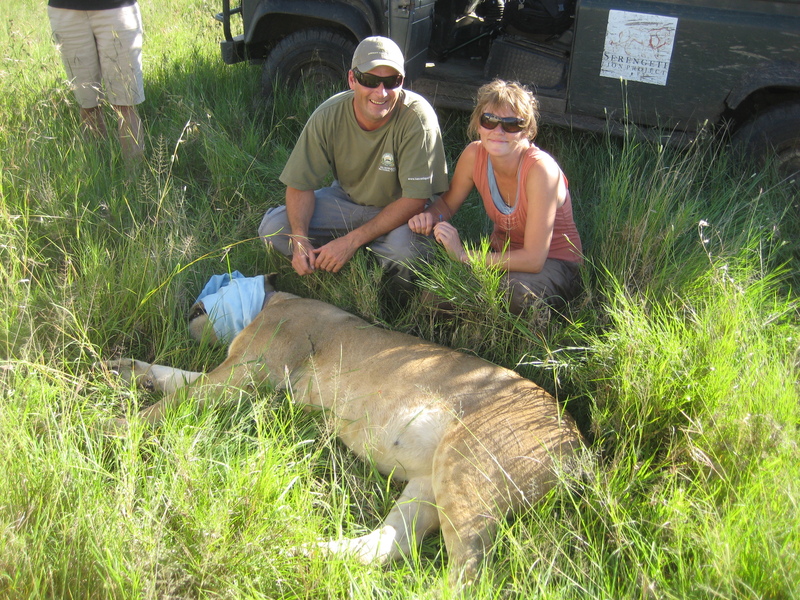 Eventually we had to leave, and our friends Craig Packer and Anne Pusey took over the Serengeti Lion Project. Craig amazingly kept it going from 1978 to 2014, and Snapshot Serengeti is an offshoot of what has become one of the world’s longest running wildlife studies. After writing up our 4 years of lion data, we returned to Tanzania in 1982 to work in conservation education; university teaching, producing guidebooks and interpretive displays, and guiding safaris. We built our home near Lake Eyasi, and experienced years of village life and culture clash, but that’s another story (in preparation). In 2003 we moved to Tucson, Arizona, but I still get back to Tanzania every year, mostly leading National Geographic Expeditions. I’m organizing my own safari to visit Serengeti and other parks in February 2018. If you seriously want to see these wonderful animals in the flesh, send me a message! Today’s blog is by Sarah Huebner, a first year PhD student at University of Minnesota’s Lionlab studying under Dr Craig Packer. She writes about Save the Rhino day that was celebrated this week. May 1st, 2017 is Save the Rhino Day, a day on which we must ponder what can be done to pull this beautiful animal back from the brink of total destruction. With fewer than 25,000 rhinos remaining in Africa, there is a strong possibility that they could go extinct within our lifetimes if poaching continues at its current pace. In addition to the problems of habitat fragmentation and human-wildlife conflict that all African animals face, rhinos have a target on their backs from poachers and criminal elements seeking to profit from selling their horns. There are two species of rhinoceros in Africa–black rhinos and white rhinos. Both black and white rhinos have two horns on their heads, a larger one in front and a shorter one behind it. It is estimated that there are only 5,000 black rhinos remaining, down from 850,000 in the mid-20th century. The reason for this dramatic population collapse is poaching and sale of their horns through a criminal network from Africa to Asia. Though the rhino was added to the CITES list of animals banned from trade in 1977, their numbers have continued to crash since then. This is primarily due to the demand in China, Vietnam, and North Korea for use of the horns in jewelry, carvings, as a status symbol, and even in medicine. Some people believe that rhino horn can cure cancer. Scientific evidence clearly shows that rhino horn, made from the same material as our fingernails, is not at all useful in medicine. Perhaps most distressing is the news that the ban on rhino horn trade in South Africa, home to the largest extant population of rhinos, has been lifted by their court system, clearing the way for the legal export of rhino horns. This does not mean that illegal trade will cease. Indeed, this move gives even more cover to the criminals trafficking rhinos. Though rhinos have the ability to regrow their horns, most are killed before having their horns sawed off, as we saw in the horrifying incident at a French zoo recently. If the rhinos are still alive when the horns are removed, they suffer terrible pain and are left to die, which many do because of blood loss. Impoverished poachers in Africa make very little for their efforts, while importers and sellers in Asia can make as much as US$30,000 for one kilogram of horn. Some estimate that the sale of both the front and back horns together is worth US$250,000. This makes rhino horn more valuable than gold or platinum. Little wonder that private reserves in South Africa wish to profit from the sale of these animals’ parts. How then do we stop this? Organizations such as the Wildlife Justice Commission and Outraged South Africa Citizens Against Poaching are working to expose the criminal networks responsible for the poaching, smuggling, and selling of these horns in Asia. We can aid these and other conservation groups by helping to finance their initiatives designed to curb poaching. Perhaps the best way we can take action is to pressure our own governments to enact diplomatic sanctions on the countries that continue to look the other way while rhino horns are smuggled across their borders–primarily China, Vietnam, and North Korea. Diplomatic acts such as sanctions, travel bans, and blacklisting by other countries could convince these governments to enforce the national and global laws already on the books concerning rhino horn. On Save the Rhino Day 2017, contact your representatives and tell them that you want them to use diplomatic methods to pressure these countries to stop the import of rhino horn. Or the only way our children and grandchildren will see rhinoceros is in pictures, as we tell them about the magnificent creatures that once walked the earth. This is another guest post by Drs. Tom Morrison and Michael Anderson about the Snapshot Serengeti Special Edition and what their research hopes to uncover. First, a big THANK YOU to everyone who has helped classified images at Snapshot Serengeti, both past and present. Without the continued help of this great online community, our research would come to a grinding halt! So thank you. A number of folks (and at least one giraffe) have asked about the new study currently up on Snapshot Serengeti, so here’s a fuller explanation of this work. Photos from our newest Snapshot Serengeti Special Season come from a camera trap experiment in Serengeti involving friends and collaborators based at Wake Forest University (US), University of Georgia (US) and University of Glasgow (UK). We set these cameras at a slightly higher height (1.5 meters in most cases), which allows us to see species from new wider angles. Admittedly, this new experimental design makes animal classifications a bit harder because we can often see far into the distance. Our advice is to simply do your best, but don’t sweat it too much if you can’t figure it out. Better to see the forest than the trees. Speaking of trees, this new study is trying to unravel the secret lives of trees. We monitor hundreds of individually marked trees around the ecosystem and revisit them each year to measure growth, survival, disease and few other things. You may have noticed little cages in some of the camera trap photos (see giraffe above). These are part of our experiment and enclose four small native tree seedlings which we transplanted to the plots after growing them in a nursery for 6 weeks. In fact we planted over 800 seedlings around the ecosystem to study the relative importance of herbivory, fire and rainfall on seedling growth and survival. 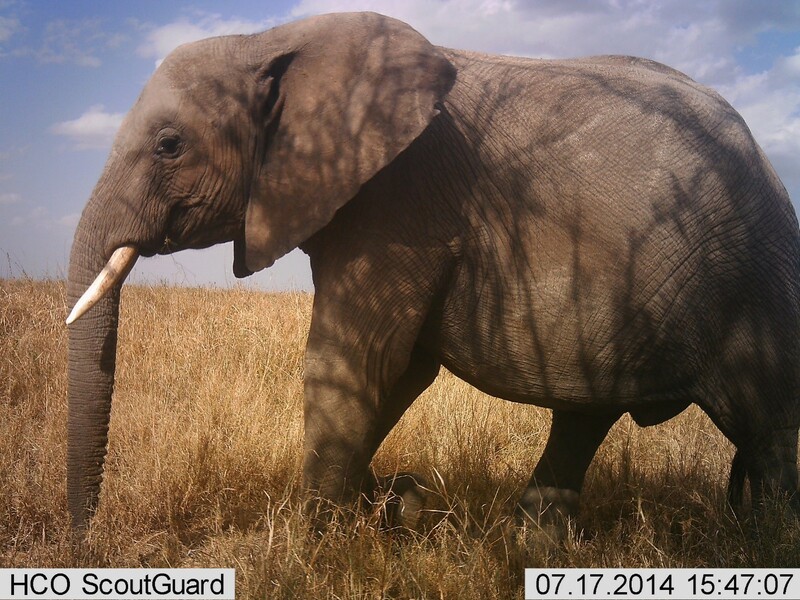 So, we need camera traps to monitor things when we’re not there. What’s amazing about this is that not only does an elephant kill an adult tree, he does it under 60 seconds. This tree is an Acacia tortilis, or the “umbrella acacia,” named for its characteristic flat top. Umbrella acacias are one of the most common trees in Serengeti and one of our main study species. Images like these help inform our study of trees, telling us how they died, or at least how many large herbivores were in the area to potentially kill and eat them. But this begs the question: if a tree falls in the Serengeti, will anyone hear it? At least we know that there’s a small chance that one of our cameras might see it. Meredith: Our brilliant team of Snapshot Serengeti undergraduate volunteers at the University of Minnesota are perhaps even more on top of the lion literature than I am! This week, we have a guest post from one such student, Clayton Mazur, describing some recent work of Dr. Packer’s on lion disease spread in Serengeti Park. This post is a synopsis of a scientific paper that can be accessed in full here. I propose we play a word-association game. I will offer a word and you think of what comes to mind. “Africa.” Did you imagine Mt. Kilimanjaro, or the towering, lush rain-forests of the Congo? “Wildlife.” Did you envision the sprawling savannas of Tanzania, home to hundreds of thousands of migrating wildebeest? If so, I would bet that your savanna also included the enigma of Africa: the African lion. Was he a graceful figure standing upon Pride Rock looking out over his kingdom? Perhaps he was laying in the shade, his dark mane flowing in the breeze as he waits for the females to return with a kill. I would argue that elegant images such as these are what come to mind for the majority the public. The portrayals of lions in the media- from Lion King to the MGM Lion- support this notion. As elegant as these images are, reality is less than elegant for the lions living in Serengeti National Park in Tanzania, Africa. 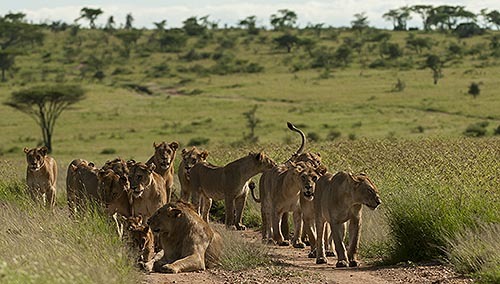 African lions have unique social structures that help them brave the tough conditions of the savanna. Lions live in families called prides; one to two male lions rule a pride. The roles of female and male lions within a single pride are vastly different. While females hunt, raise the cubs, and reproduce, male lions defend the pride from attack by other predators such as hyenas. Living in a large family group offers lions protection, but it also comes with costs. One cost is that females need to supply a large number of individuals with enough food for survival. Female lions coordinate hunts whereby they stalk prey and then give chase, but this technique only yields about 26% success. The low success rate forces large prides to split or starve. Perhaps a more interesting difficulty of living in a large pride is the spread of disease within lion populations. 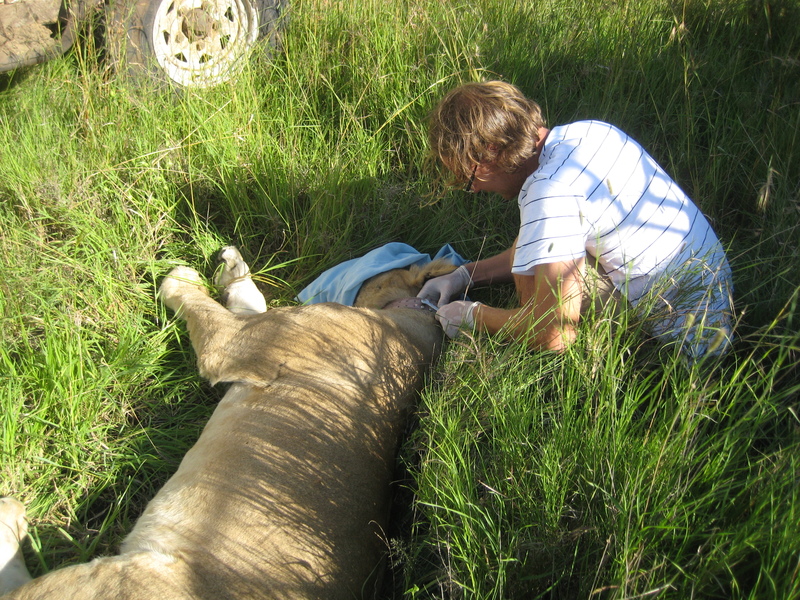 As Dr. Craig Packer has found, disease prevalence is a threat to the current lion population. A fatal disease that persists in the carnivores of Serengeti National Park is Canine Distemper Virus (CDV). CDV infects a range of carnivores, from dolphins to rodents and even some primates. The viral infection causes encephalitis, pneumonia, anorexia and eventually, death. You may be familiar with CDV if you own a dog, for many owners in the US vaccinate their dogs for CDV. In Serengeti National Park, where local villages cannot afford to vaccinate their dogs, CDV is a conservation concern for African Lions who contract CDV from domestic dogs. To try to remedy the concern, an intense vaccination regime started in 2003. Packer and colleagues attempted to characterize the progression of CDV in both domestic dogs and African Lions. Their goal was to determine if domestic dogs were responsible for the infections observed in African Lions. The team also wanted to determine if the 2003 vaccination program had any effect at reducing CDV in the domestic dogs and/or African Lions. The scientists worked with blood plasma collected from both domestic dogs (obtained from 1992-2012) and from African lions (obtained from 1984-2012). After collecting the blood samples, the team ran serological tests to detect for the presence of the CDV virus in individual dogs or lions. Using a Bayesian model, the scientists then calculated the probability that an individual lion or dog would contract CDV in one year. The scientists also used sensitivity models to determine the extent at which domestic dogs transmit CDV to lions. From the results of these models, the scientists were able to comment on the fate of the lions with regard to CDV. The research team drew results by interpretation of the two models. They found that CDV had persisted in the populations of both dogs and lions for more than 25 years. Outbreaks of CDV occurred in 1981, possibly in 1976, and in 1993. Not only do these results suggest a historic presence of the fatal disease in the national park, the dynamics of each outbreak of the disease was unique. The scientists found that the year in which CDV infected the most dogs differed from the year in which CDV infected the most lions. The researchers proposed that this pattern identified domestic dogs as initial vectors for CDV in the park. After a 1994 outbreak in the lion population, the dynamics of the outbreaks become more disjoint. The disjointed dynamics between the domestic dog and lion populations suggest that after 1994, infections cycled through the dog population and the lion population separately. However, the spread of CDV between dogs and lions was not eliminated after 1994. With domestic dogs established as an initial vector of CDV, the scientists wanted to know transmission rates between domestic dogs and lions. Again, they used a sensitivity model to predict this factor. The scientists found that domestic dogs were ten times more likely to spread CDV to lions than lions were to spread CDV to domestic dogs. With such a high prevalence of CDV in the domestic dog population and the tendency for CDV to spread from dog to lion, the effects of the 2003 vaccination effort were an important factor to analyze for the conservation of the Serengeti National Park lions. The scientists first analyzed the effects of the vaccine on the domestic dog population. 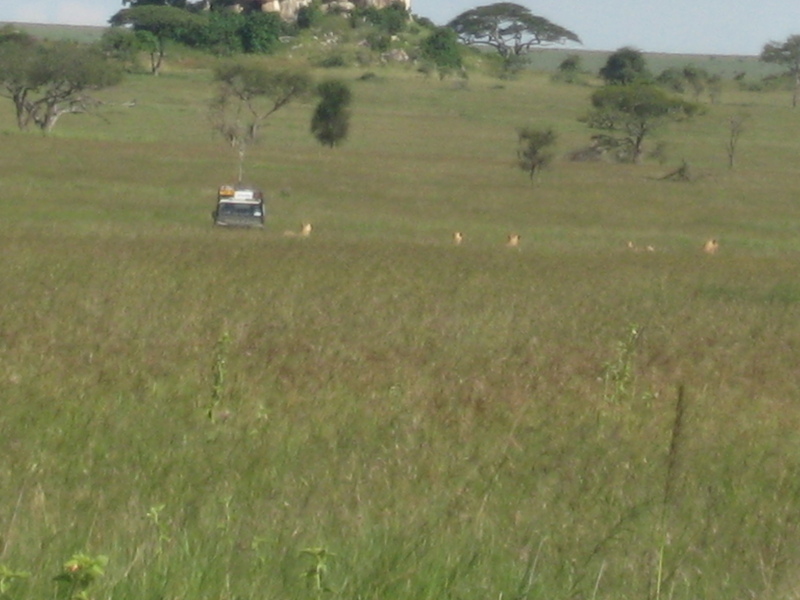 Before 2003, there had been very sparse vaccination in villages surrounding Serengeti National Park. As was expected, this vaccination effort did little to curb CDV infection in either lions or domestic dogs. It was not until after 2003 when all villages to the east of Serengeti National Park and all villages within 10 km to the west of Serengeti National Park vaccinated their dogs against CDV did there exist a decrease (~5%) in CDV infections. With CDV slightly decreased in domestic dogs due to the vaccination effort, was there a similar decrease in CDV infections in the lion populations? Unfortunately, the sample size of lion serum that the scientists could obtain was not enough to comment on the updated magnitude of dog-lion CDV transmission. Overall, the scientists determined that CDV was still able to cycle in the lion population with very little reduction in the prevalence of the disease. However, not all is hopeless for the lion populations of Serengeti National Park. Dr. Packer’s team suggests that direct vaccination of lions may be more effective at preventing the disease. Additionally, the team suggests that advances in serological techniques would allow for increased accuracy when researching episodic diseases, such as CDV. 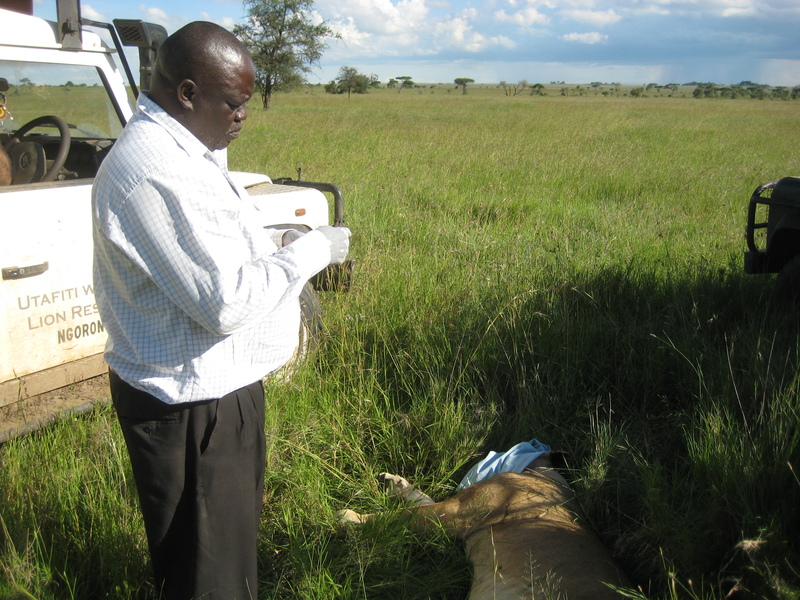 Implementation of safe vaccines coupled with more accurate serological tests could minimize the effects of CDV outbreaks and ensure the health of the Serengeti lions. As evident from the work of Dr. Packer and colleagues, there are threats to the conservation of the lion populations of Serengeti National Park. Not only do prides run the risk of individuals starving to death, splitting, and human-lion conflict, disease is another risk factor of living in a pride. Yet, these prides, these perfect families, come to mind when the public thinks about lions. Idealistic images of cubs play fighting or suckling from their mother are important for generating interest and compassion for African lions. One can be content with the image of the brave, courageous, elegant male lion standing on Pride Rock overlooking his kingdom, but one must simultaneously recognize the reality of the lion’s plight. Only then will conservation for lions be truly feasible. Meredith: Not all of our exciting research takes place in the field — there’s a lot going on behind the scenes in our lab, and we rely on an invaluable group of undergraduate research assistants to help us go through the massive amounts of Snapshot data you guys provide! 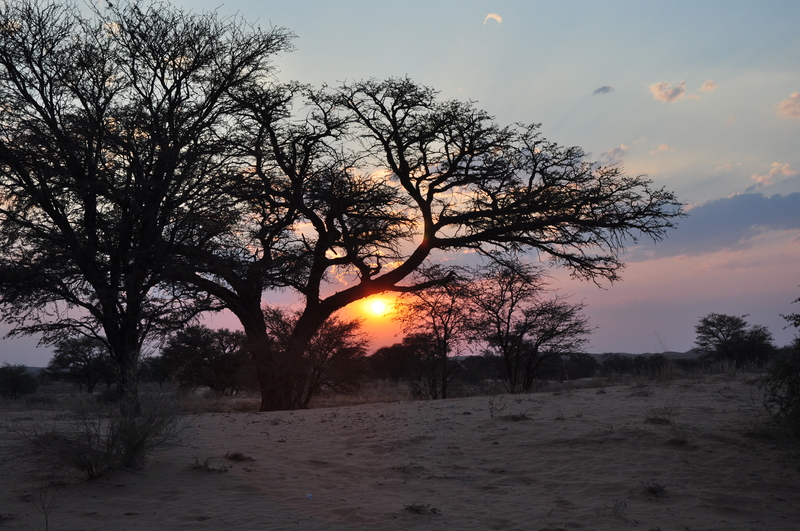 Jess has been working with us for the last few semesters and has some insight on what it’s like to work with this Serengeti data set. Hello everyone! My name is Jessica Dewey, and I am currently an undergraduate student at the University of Minnesota working in the research lab that runs this project! Cool, right? I’m new around here so I thought my first post should be an introduction of myself and how I got involved in this lab. Imagine me a few years ago: a young high school student, undoubtedly procrastinating in some way, suddenly stumbling upon a website called “Snapshot Serengeti”. At the time, I was only certain of two things — I loved animals and I loved research – so this discovery was perfect for me! I spent most of my evening identifying animals, and continued to go back to procrastinate even more. Now flash forward to last semester, when I get an email from one of the university biology clubs saying that Dr. Craig Packer, head of the Serengeti Lion Project, will be giving a talk about his work. Well I HAVE to go! I sit and listen intently, eager to learn all about research being done with lions. Near the end of his talk he then mentions a website (Snapshot Serengeti, of course) where all of the images from the field get uploaded for the public to identify, and I’m immediately floored. How did I get so lucky, to go to the very University that uses those pictures I spent time identifying years ago in their research? The best moment was when the graduate students working with Craig said that they were looking for undergraduates to help them with their research. I took the opportunity to introduce myself to Meredith, and so far my experience in this lab has been amazing. I’ve learned a lot about how field research is done, how data is collected and analyzed, and what it takes for someone to actually be a researcher in the field. Not everything I do is as fun as going through tons of pictures a day, but all of the work in this lab is interesting and meaningful, and that’s what really matters to me. One of the major projects the lab has been working on with Meredith is trying to characterize changes in habitat at the camera trap sites by looking at the Snapshot pictures. We have been going through the giant list of data to find pictures to use for this characterization. We haven’t been going through the images themselves – rather the metadata, or the data ABOUT the data (it’s literally the biggest Excel sheet I’ve ever seen). It can get monotonous at times, but what keeps me going is the thought that when we finish picking out all of these random images, we will get to look at them and use them for this research project. I hope that was a thorough enough introduction for you all, but let me say one last thing: THANK YOU! Without the time you all put in to identifying these pictures, the research we are doing would not be happening at the pace it is. Have you ever seen the look on a dogs face when confronted with a cat that fights back? There is utter confusion about his role in life, “hang on a minute that cat is way smaller than me, I could stomp her in a second, but now she’s scaring me?” our imaginary dog says. Well that’s about my reaction the first time I came face to face with a honey badger. Honey badgers are small, reaching somewhere between your ankle and your knee and no more than 1 meter long. They weigh around 10kg but don’t let these dimensions fool you; a honey badger is full to the brim with confidence. Most small animals will run when they find themselves face to face with a human; a sensible option given our species general nature. A honey badger on the other hand probably won’t and this can be very disconcerting. One night I was sat round a fire in what classed as my garden, though in reality there was nothing to distinguish it from the rest of the bush surrounding us as home was in a nature reserve and there were no fences. It was a crisp, for the lowveld in South Africa, winters night and the stars were shining brilliantly as we sat in the sand by the fire waiting for the chicken to finish cooking. From the other side of the river the hyena started their whooping and the hippo disputed the rights of some patch of dry grass. Winter is the dry season here and things get difficult especially for bulk grazers. The African night sounds had as captivated as usual. The chicken smelt good. My husband was just about to rouse himself to check it one last time when we both heard something moving behind us in the dark. 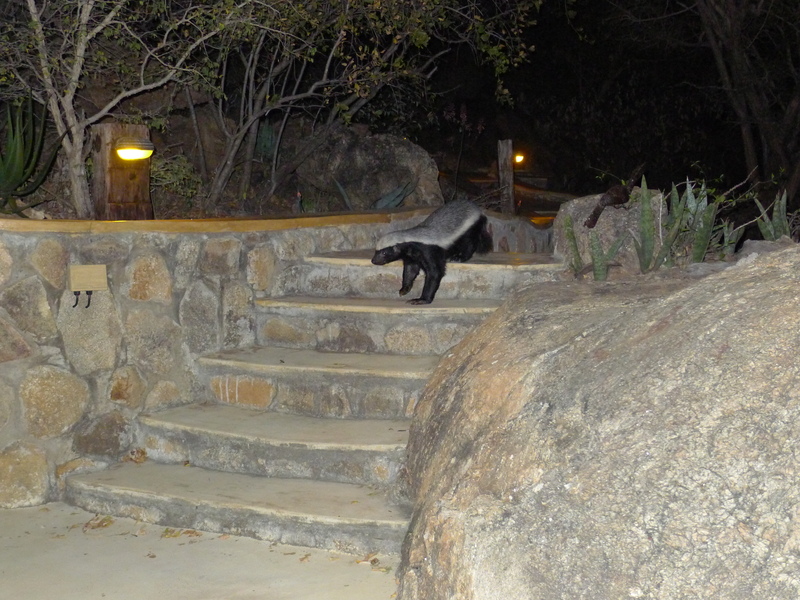 As it got closer we saw it was a honey badger moving at a lopping determined gait that they have straight towards us. It was a wonderful treat to see one of these guys close up and for a few seconds we were rapt. But it didn’t stop. It trotted straight to the grill, a small pause to give us a low growling warning and chomp, there went half our chicken. We couldn’t believe our eyes, this wasn’t a hand reared animal or an animal in a public campsite in a national park that gets used to people, this was a real live wild animal. It had no fear of us, it totally wrong footed us as we were not expecting it to just bull doze its way in. Needless to say we grabbed the rest of our meal and took it into the safety of the house to finish in peace. Honey badgers really are remarkable creatures. Whilst in search of food they can cover up to 30km in a night. They eat a varied diet of mammals, birds, reptiles and some roots and berries and of course honey when they can get it. They climb well and can swim; they will dig furiously to follow a rodent down a hole and just don’t seem to give up in their pursuit of prey. Honey badgers are tough and there are many stories about them killing buffalo, fighting lions, being bitten by cobras and surviving. One of the tricks they use to help evade predators is by having very loose skin around the back of their necks. A lion or leopard will grab for this area, coming up with a mouthful of skin but leaving the vital bones and muscles untouched. The honey badger can then twist round and start biting and scratching with it all its might often inducing the dog/cat scenario from the start of this blog i.e. predator dropping honey badger in utter surprise. So next time you classify a honey badger on Snapshot Serengeti remember it’s not always size that counts. It started with some mysterious footprints around the Loliondo Kopjes. There were a lot of fresh paw marks in the mud following the road. I could tell it was a big pride but the only big pride with a territory nearby was the Young Transects. But I could not hear their collar. Neither could I hear any of our other prides. I drove around for a while looking for lions, especially on the rocks and under trees. I didn’t find any and guessed it could have been the Young Transect lions anyway, only without the collared female. A couple of weeks later I was headed out east when I soon caught eye on a big group of lions. As I drove closer I realized they weren’t any lions I knew. I tried to get photos of all of them but it wasn’t easy knowing who you’d already got in a group of 17 lions. Luckily they all started walking along the track. All I had to do was park ahead of them and take photos as they passed one by one. Once I had photos of all their left sides I went home to try to figure out who they were. I concentrated on the older females as the youngster probably never had been seen before by the Lion Project. After a while I found a couple of matches. It was TR86 and TSF from the Transect Steady pride, not seen since December 2009, almost three and a half years earlier. 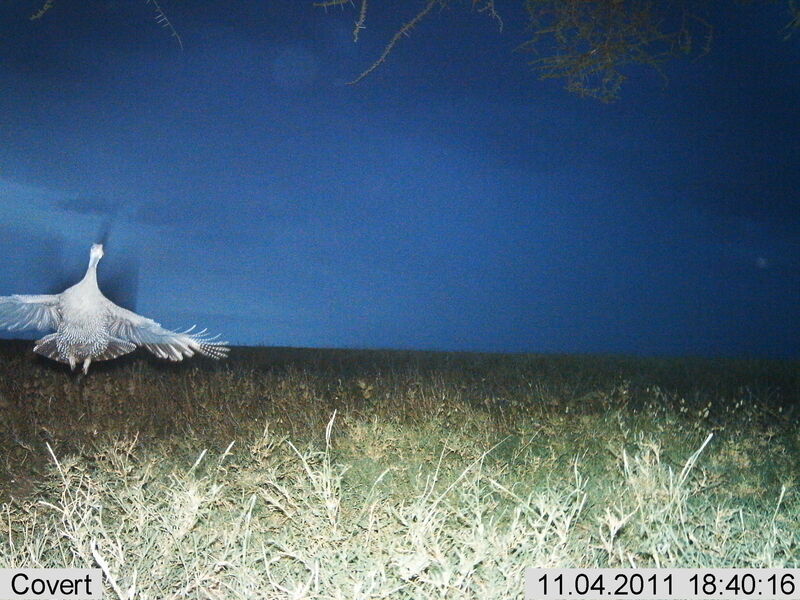 But the last time they were seen regularly in our study area was in 2008. Now I contacted TANAPA and the vets to organize a collaring of one of the females. They were coming. I drove back to the place where I’d seen the lions and hoped they hadn’t walked too far. I found them in the shade of a tree. Then a long wait started for the vets to organize themselves and drive all the way from Fort Ikoma. Once they came, the collaring went smoothly, the rest of the pride watching from a distance. All of the lions of the TS pride, watching us warily as we try and create enough space to safely collar our lion. TANAPA vet preparing to take samples. It’s pretty exciting to to be this close to a lion. Their paws are BIG. About a week later I found the pride just outside the northern edge of our study area along the Pipeline track. Two more old females known since before had joined them, TR93 and TR106. Then they disappeared. So two weeks later I decided to search for them and drove along the Pipeline track north. But instead of driving on the actual track, which in many places was disappearing because of little use, I drove parallel to it, hitting all hilltops to be able to pick up the radio signal from a greater distance. The drive was terrible as the hills in the area are specked with large rocks and I had to drive dead slow. I held on the the steering wheel as little as possible. Having no power steering means that every time I hit a rock I risk breaking thumbs or worse. I picked up the signal after a while but I still had to pass several hills before finally finding them, right by the track at a river confluence. That was quite far north of our study area and too far to go and see them on a weekly basis. The future will have to show where they finally settle. What does silence mean to you? Maybe it’s that moment at the end of the day when the telephones stop ringing and the office hubbub finally stops and you can hear yourself think. Maybe sitting in your garden listening to the insects and aeroplanes pass overhead. Or maybe it’s that first 5 minutes of waking before the baby starts howling. Whatever it means to you the point is silence isn’t really silent. Something is always making a sound even if it’s a leaf rustling in the wind or a cricket singing. In the African bush night time silence is deafening. Just before sunset there is a rush of activity. The day shift starts looking for a place to spend the night whilst frantically searching out that last mouthful of food. Young banded mongoose are scolded into their burrows by older siblings. Antelope take a drink before heading to thicker cover. Francolins are calling out their staccato calls whilst sandgrouse flock to drink. As the sun sets and darkness looms everything quietens down, the last to make a noise are the guinea fowl who wait till it is just dark to, one by one, barrel up to adorn their favourite roosting trees like giant Christmas baubles. They finally settle down, and the nearby baboons stop squabbling and there is a moment’s peace before the night shift takes over. The Scops owl is first with its ‘poop poop poop’ call sounding almost like an insect. 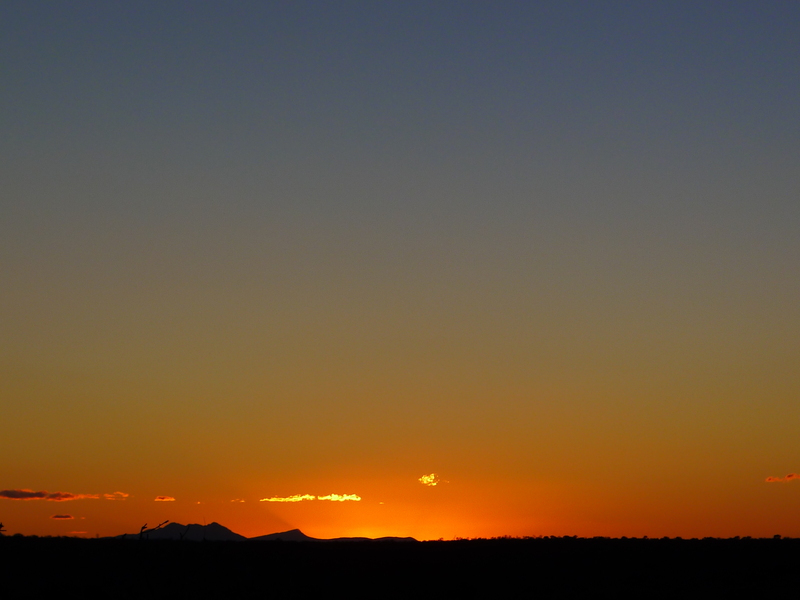 Then the night-jars join in. A distant rasping bark and the jackal are off calling ownership of their territory. They stop suddenly and a moment later there it is, the slow wo-oop! Woo-ooop! and the hyena clan are declaring they are up for business. There has been no respite to the constant noise of the African bush during this transition between day and night; a seamless mix between the two sound tracks. As the evening wears on and the night shift are out hunting in earnest it gets quieter. If you are lucky enough to experience this it is unforgettable. The silence is thick, it hurts your ears and you want to shake your head to clear it. You are straining to hear anything out there in the blackness and your senses have you on high alert, never mind that you are in a vehicle your primal instinct knows this is Africa and beasts roam that want to eat you. The only sound is a cacophony of insects and it is this that gets in your head, it is a relief when a spotted eagle owl calls breaking the pitch and giving you perspective again. Staring into the blackness you see a shape move , you can’t make out what it is, then comes a noise that goes right through you, a guttural, low sawing sound, a leopard is calling broadcasting its presence using the ground as a sounding board. He walks out in front of you, pauses for a moment, then strides off purposefully into the night. The silence of the African night is palpable. You could slice it with a knife. It is so full of promises of wonderful animal encounters that I never want to sleep. It’s my favourite sound of silence; what’s yours? Peter and Faith here! Last week we had the opportunity to attend the Bell Museum’s Cafe Scientifique. Cafe Scientifique allows scientists from all disciplines and specialties to share their research directly with the public in the form of a casual presentation given at the Bryant Lake Bowl in Minneapolis, MN. This past month’s talk was given by Snapshot Serengeti’s own Professor Craig Packer, giving a historic rundown of some of the highlights of the lion research conducted by the University of Minnesota’s Lion Research Center. As prospective lion researchers ourselves, it was both interesting and valuable to hear the conclusions of past research from the perspective of the researcher. Not to mention having it be told in a casual and humorous way, which is a refreshing break from the stack of scientific papers we are usually reading! The audience, which was made up of local community members, was also engaged in the talk. Even though Dr. Packer presented complex graphs and maps, he explained the research in a way that was accessible to everyone. The studies that were discussed during the talk included the lion’s mane study, why lions form prides, and even a bit about lion conservation and the potential use of fences to protect vulnerable populations. In addition to reviewing past research, Dr. Packer also talked about the lion project’s current research–Snapshot Serengeti. The audience was amazed by how fast volunteers sorted through the millions of images on Snapshot Serengeti. (To all of you that have contributed to the success of “Snapshot”, cheers to you!) By the end of the talk, the entire audience, (including us!) had loads of insightful questions, and left with a piqued interest in the world of lion research.